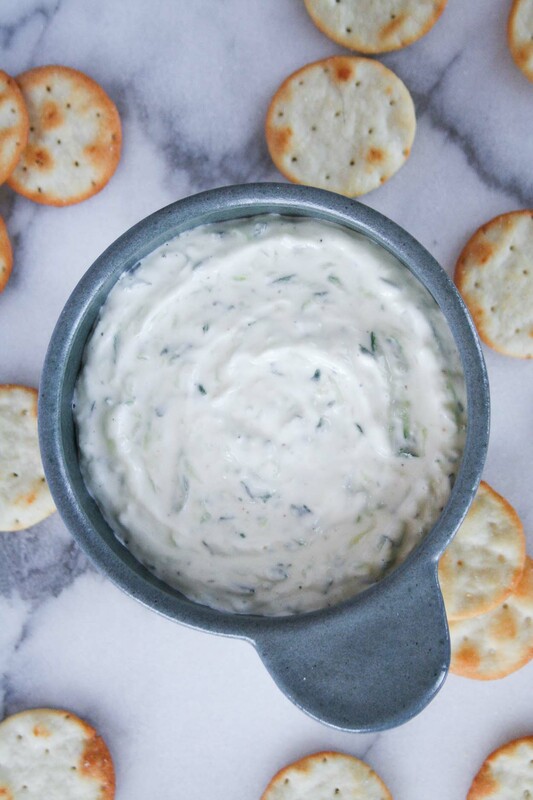 This thick and creamy Greek yogurt tzatziki sauce is made from cucumbers, lemon, and garlic creating the most addicting (and healthy!) sauce. I don’t make everything from scratch. There. I said it. Are you happy?? Who has time to make everything from scratch and who would want to?! Sometimes, store bought is best. You know that I don’t always make my own pie crusts. And while sometimes I make puff pastry from scratch, other times it’s just not worth it. But today is not one of those times. I’ve bought tzatziki sauce from the store a handful of times and I can’t do it anymore. It’s the dill. I just cannot do dill. And because dill is a key ingredient in traditional tzatziki sauce, I am forced to make it from scratch. I can remove black olives from my pizza and eat around the blue raspberry flavored gummy bears, but there is no possible way to remove dill from store bought tzatziki. Can be made in advance – in fact, I recommend it. 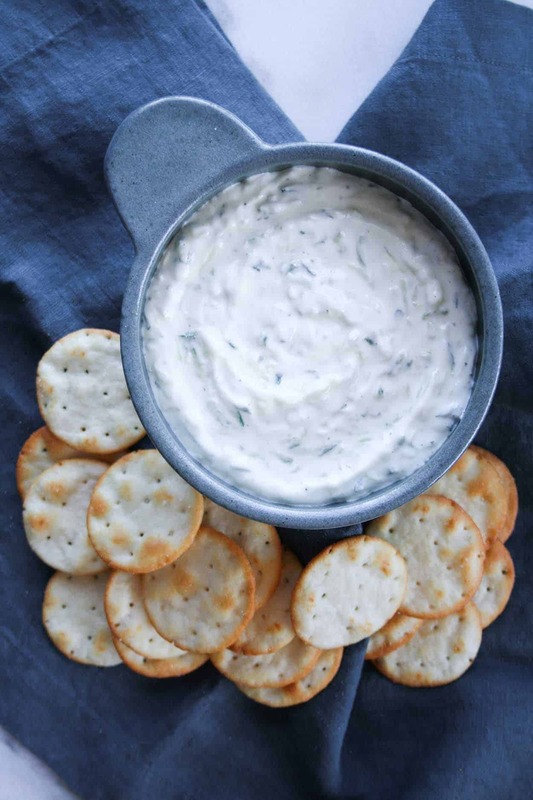 Make sure you check back here on Friday for my favorite way to use tzatziki! Hint: it involves naan and a recipe from Ottolenghi’s Jerusalem!! 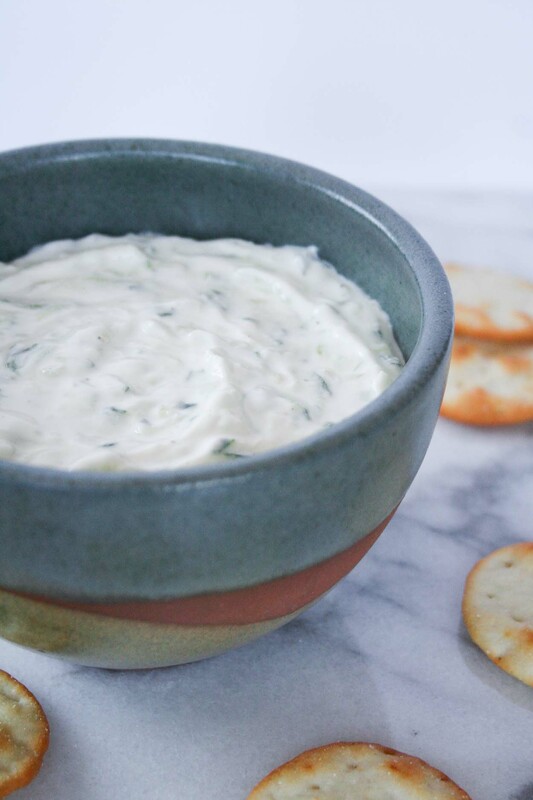 I have been putting this Greek Tzatziki Sauce on everything! If you make this sauce or any of my recipes, don’t forget to post a picture social media and use the hashtag #imhungrybynature for a chance to be featured! Slice the cucumber in half lengthwise and scoop out the seeds. Grate the cucumber into a colander, squeezing the cucumber to remove excess water. Sprinkle salt over top to draw out more water. Let sit. Press garlic clove into bowl. Add lemon juice, olive oil, and pepper. Stir to combine. Add Greek yogurt and stir to combine. Squeeze cucumber again to remove excess water. Add to Greek yogurt mixture, stirring to combine. I could literally eat that sh*t with a spoon. Oh I’m so glad I’m not the only adult who doesn’t love dill. I’m hosting a greek cooking club in a couple weeks and will definitely give this a go. Sounds delicious! Oh my gosh that sounds so fun!! I would love to hear what else is on the menu… I love Greek food! I love greek food, too! I’m doing lemon chicken skewers with this tzazkiki, a friend is making pita, and another is making baclava along with a couple other dishes to be determined. Cannot wait! Ummmmm well that sounds amazing! If I lived in Michigan, I would probably end up inviting myself over for the book club!! Oh I never make pizza or pasta sauce. And I definitely consume pizza more than I should… oh well! No dill?!?! 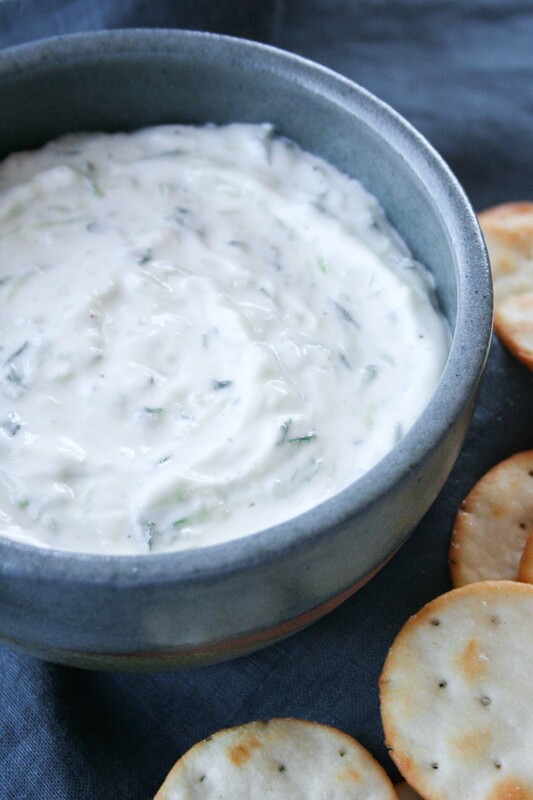 Dill is the essence of Tzatziki! LOL! I’m glad you found a way to enjoy it! Once I was sitting with a few older, wiser ladies and we were talking about our favorite appetizers. I was horrified when they started saying where they *bought* their favorite bruschetta, salsa, etc. My young (oh so young) and newly married self said, “Why don’t you make things from scratch? I feel guilty when I entertain and I buy the food I serve.” They all laughed and one lady (very lovingly) said to me, “Honey, if you make everything from scratch you’ll drive yourself crazy before age 35!” LOL LOL LOL! So grateful for that conversation! I only have to make food for myself and my husband and I feel that way a lot… and I can only imagine that feeling will get stronger as there are little kids running through the house! “because I’m an adult and I do what I want” omg insert laugh/cry emoji here. LOVE IT! You do you girl 😉 Can’t wait to try out this dip! Bingo! Sometime you just gotta role with it… I hope you love it! 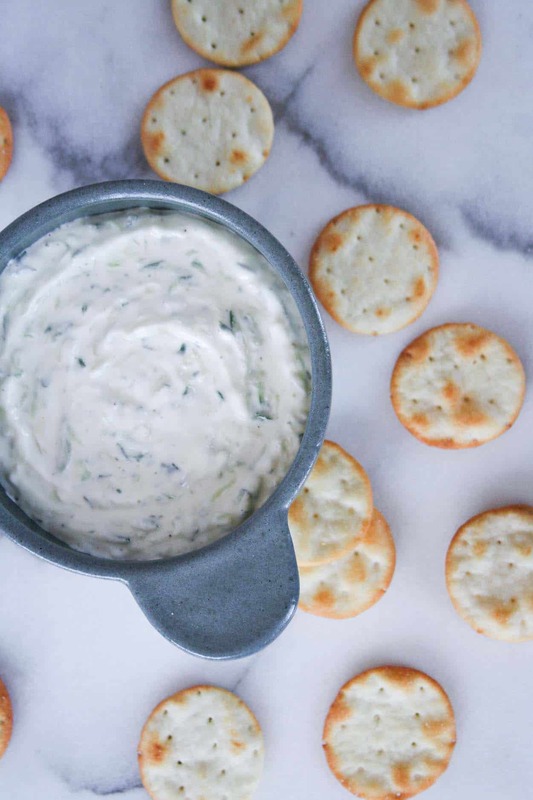 Tzatziki is one of my favorites! And I definitely don’t make everything from scratch either. These days, convenience is key lol. Seriously! Life is busy and sometimes is just way too hard to make everything myself… and I definitely eat out more than I’d like to admit, but it’s hard when Chicago has SO MUCH GOOD FOOD! If it has no dill and no mint, what are the green bits in your pictures? It’s the cucumber! I scooped out the middle, but didn’t take the skin off. So when you grate it, there will be pieces of the green skin. Hope that helps Danielle! Beyond frustrated trying to find grocery store sauces or even restaurants that don’t add so much dill that it punches you in the tongue! You had me when you mentioned the sacrifice we share in picking black olives off pizza – ahhh, what we do for those we love… Thanks for the recipe, didn’t know about ‘wringing out’ the cucumber which keeps the sauce nice and thick. I used a heavier and flavorful marinating olive oil which adds a little something extra! Exactly! I will be picking off black olives until the day I die 🙂 And that marinating olive oil sounds great! Are there additional flavors in it? Nothing additional (yet) just a heavy full-flavored evoo. But.., my penchant for experimental cuisine is making me want to add a bit of horseradish to try with greek-style bbq shrimp on a pita – with all the fresh garden fixins of course. So far I’m 50/50 on these sort of adventures, but it keeps things interesting – I’ll let you know how this one works out! I have never made tzaziki with dill. I learned to make it with parsley and mint in about a two to one ratio. Give it a try! It’s fantastic. I made it for a Greek friend who always uses dill and she loved it. Oh thanks so much for the tip – I will certainly do try that next time!! U R A LIFE SAVER HONESTLY, THANK U FOR ALL THE DIPPS I AM ALSO HAPPY IM NOT THE ONLY MOTHER WHO HATES DILL TOO!!! You are welcome Megan – I am glad I can help!! The Recipe was Awesome… and tasted Better…Honestly than the Restaurant! Didn’t have Dill, and not having it made me Wonder what did it add??? It was Never missed… thank you ♡!!! Thank you Mikki – I am so glad you enjoyed it! Hi Christine – I do not calculate smart points for my recipes, sorry! I hope you enjoy the sauce though! !